​Pupils from 24 schools descended on Clifton Cathedral on Friday (Dec 7) attempting to set a new record. More than 850 people including a baby, shepherds, angels and a real camel, donkey and some goats attempted to smash the current record which stands at 743. The outside of the cathedral was transformed into a festive market place with children dressed in costumes ranging from roman soldiers to market traders. The animals were also on hand to help bring the Christmas story to life. 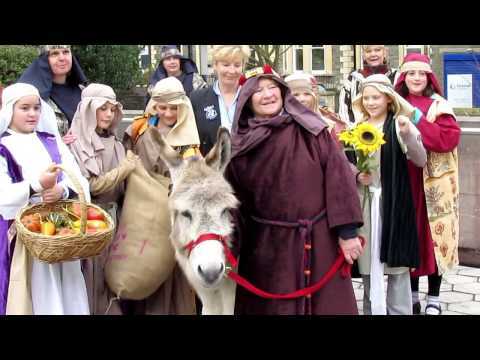 Pupils from Alexander Hosea School in Wickwar played the main characters of the nativity complete with Mary and Joseph who lead Gigi the donkey around the cathedral while the children sang ‘Little Donkey’. The event coincided with the annual carol service for primary schools with readings provided by pupils at Cherry Garden Primary School. Pupils not only sang Away in a Manger but performed a sign language version at the same time, with a further performance of Little Drummer Boy by St Mary’s CE Primary School in Yate and Sing Ye Hosanna! by The Tynings School. In the run up to the record break attempt, the event has been incorporated into lessons with the children learning all about how to make a biblical costume. The current record was achieved by Welton Baptist Church and the community of Midsomer Norton in Somerset on 2 December 2011.